The pig (or Schwein) is a good luck symbol in Germany, in this case applied to various sports/games. 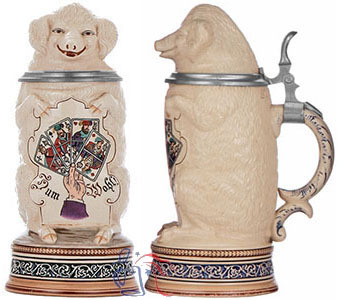 Four versions of this stein are known to exist, with images depicting a bowling scene (right), playing cards (below center), shooting symbols (below left), and billiards (not shown). Note also the existence of two different lid inlays, as well as base variations (compare below).